All of our sheepskin outerwear and slippers are made of genuine (real, not imitation) sheepskin or ‘shearling’. ‘Shearling’ and ‘Sheepskin’ are interchangeable terms and they both refer to the natural hide and wool of the sheep. The hide has silky wool on one side and suede on the other side. Some skins have a smooth leather finish as opposed to a suede. The tannery calls that an antique finish. As opposed to some cheaper qualities of sheepskin or imitation hides, the top quality shearling we use is one piece continuous natural hide – the wool is not mended, sewn or glued to the suede. This means that the wool you see is not a separate lining. We also create deerskin vests for women, elkskin vests for men and deerskin booties for infants and children. These deer and elkskin garments are made from authentic hides and have an added cloth lining on the inside of the item. The deer and elkskins are especially soft and supple skins that are smooth and buttery to the touch. These product feature top-grade lambskins (another word for sheepskin or shearling) for the body of the garment, with natural deer and elk antler for the buttons and tough nylon thread to sew it all together. All seams on our shearling outerwear are double-stitched and the shearling jacket and vest buttonholes are bound for good looks and durability. We create the buttonholes deliberately snug to begin with as they will loosen up and stretch with use. The hem stabilizers on the sheepskin coats help prevent, to a degree, the natural curling of the garment. The softest and most supple skins are selected for sleeves and collars to assure comfort and flexibility. All of our sheepskin slippers, shearling outerwear, elkskin vests and deerskin vests are handmade by Diane Blessing at her shop in Alma, Colorado. Diane has been making custom sheepskin apparel for over 30 years. The custom, handmade quality of our product sets a Sheepherder product aside from your average big-box or chain sheepskin item. Diane will custom design and fit your sheepskin jacket or shearling vest to your specifications. This means that you get to pick your color and style and we will tailor the fit to your exact measurements. If you need an especially long, short, small or large item, we can accomodate most any size requests. Where does the sheepskin come from? These shearling garments are made from the skins of domestic sheep from the western United States, mostly in the Rocky Mountain region. They are raised commercially for their meat and the hides are a valuable by-product which is tanned and processed here in the United States. The sheep, deer and elk that we use for our skins are NOT an endangered species. To process this quality sheepskin, it takes a system of 21 days with over 100 intricate steps to create the soft, supple sheepskin we use to make our sheepskin jackets, vests, shearling slippers and headwear. When sheepskin is processed correctly it creates a hide that naturally wicks away moisture from the body and that remains cool even in high temperatures. 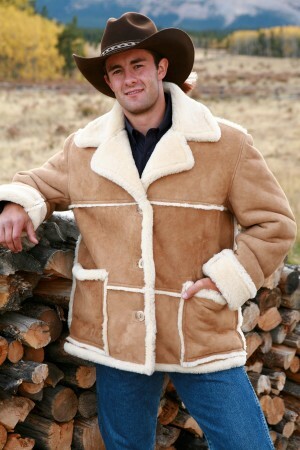 Sheepskin is extremely warm and comfortable but will not make you sweat like a synthetic fabric may. Because it is a hide it also blocks wind extremely well. 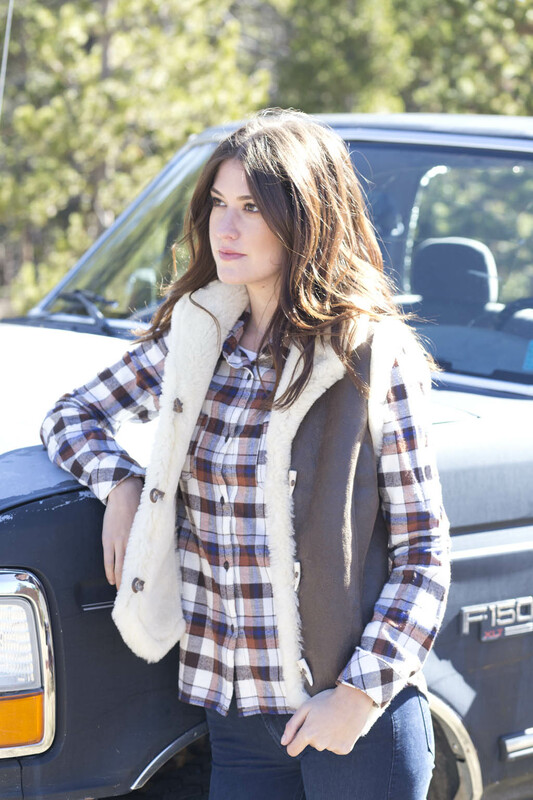 The buttons we use for our sheepskin vests and coats are made from antlers which are shed annually by deer and elk. They are handmade and each set is truly one of a kind. I received the shearling coat today and it’s just what I was hoping for. The quality and craftsmanship is beyond excellent. Now I can’t wait for the weather to turn and be colder so I can wear it. I hope you have a warm safe winter. Unparallel quality and exquisite craftsmanship! I bought a few pieces from Diane and she truly is an artist! !